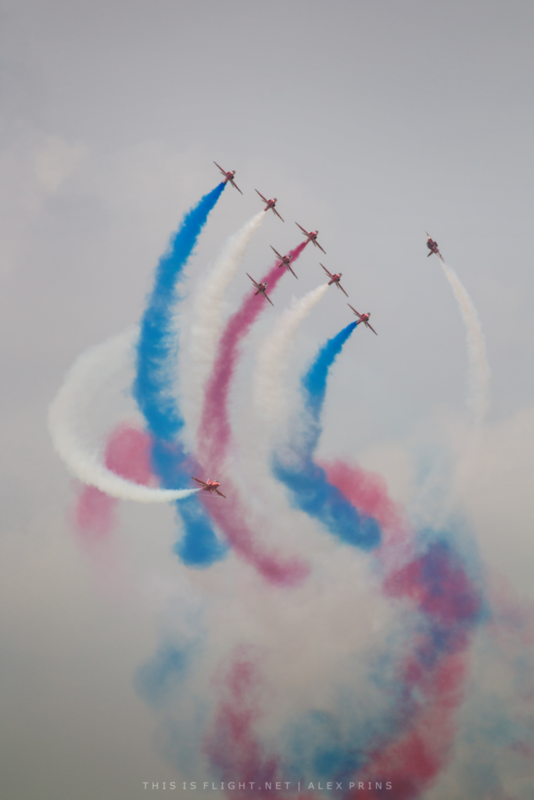 The Royal International Air Tattoo this year had the distinction of being the official international celebration of the Royal Air Force’s centenary – for years a mouth-watering prospect. The 2018 edition of RIAT, however, managed the enviable feat of staging one of the best airshows in recent memory, whilst simultaneously leaving unfulfilled the tantalising promise of what could have been, as the home team’s anniversary felt at times an irrelevant side-show. 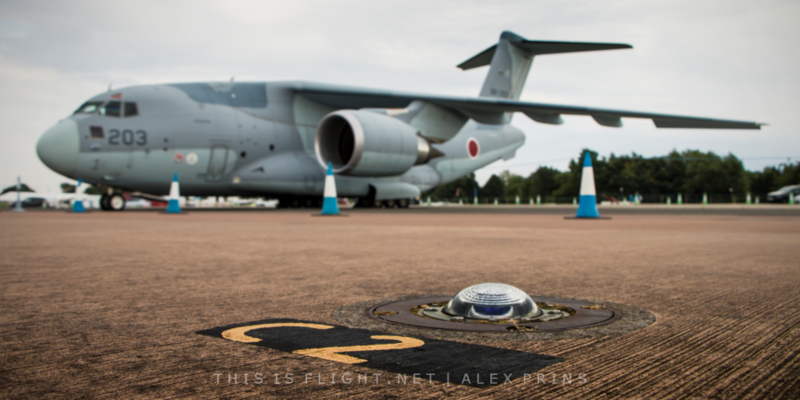 Taking place over 6 days, featuring over 25 hours of flying over three full show days, with 302 aircraft based on-site at RAF Fairford, RIAT 2018 was always going to be huge. As expected, Europe’s top display teams once again converged on Gloucestershire, ably supported by a select few items from further afield. Perhaps most notably this year, however, the 2-mile static display was veritably heaving with a variety of aircraft unprecedented in the current era; the most high-profile were such gems as a rare return appearance by the Estonian Air Force Antonov An-2 and Ukrainian Air Force Il-76 Candid, the European debut of a JASDF Kawasaki C-2, the RIAT debut of the sole flying Embraer KC-390, and the perennial might of a US Air Force B-1B Lancer. 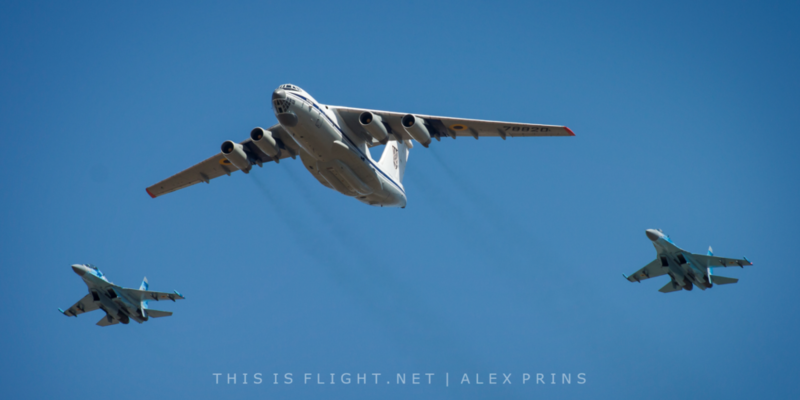 Indeed, it is hard to think of any airshow worldwide that in the past decade has attracted such a varied and eclectic selection of rarities from all corners of the globe, particularly as air forces internationally continue to shrink. Both the flying and static displays were, however, sadly hit by a string of high-profile last-minute cancellations. From the static park was lost the Royal Canadian Air Force CP-140 Aurora, Polish Air Force Su-22 Fitter and US Air Force B-52H Stratofortress, among several others. The flying display unfortunately lost two of its star items in the form of a Romanian Air Force MiG-21 LanceR-C due to a fatal accident at a Romanian airshow the week prior, and a French Navy ALT-2 Atlantique which was called off on operations right at the end of the final arrivals day. Fortunately, the latter did at least manage to fly a display rehearsal on the first day of arrivals, which afforded many of the most dedicated enthusiasts a rare chance to see this ever-elusive aircraft in flight. While such rare aircraft were lost, much of the remainder of the flying display was nonetheless of a very high quality, and some rarities remained. This included a very welcome return by a Ukrainian Air Force Su-27P Flanker for the second consecutive year, from the 831st Tactical Aviation Brigade, flown by Col. Oleksand Oksanchenko. 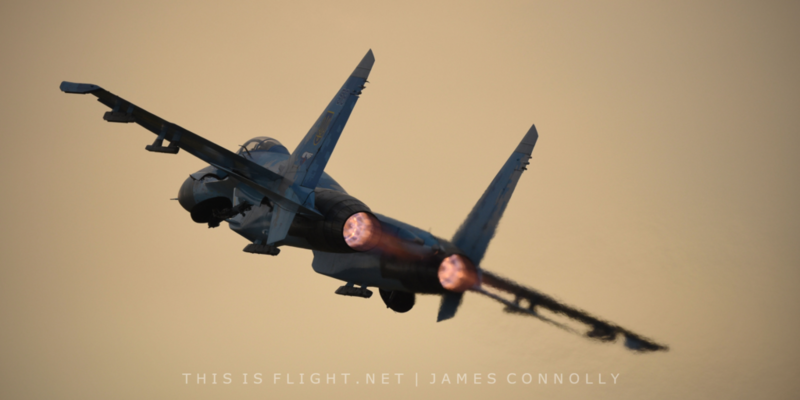 Despite a tense low-level slow pass during Friday’s display, which subsequently sent social media into overdrive, Col. Oksanchenko nonetheless consistently provided a stellar performance which showcased the power and manoeuvrability of his aircraft. Unlike last year, the weather did nothing to hamper the displays, and allowed for repeated examples of the notorious tailslide. Another rare appearance was made by the Canadian Forces CF-118A demonstration team, flown by Capt. Stefan Porteous. 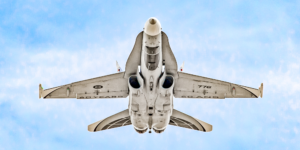 While by some margin the most simplistic and formulaic Hornet display of the day, being very much of the more disjointed American style, the aircraft nonetheless won the award for the best paint scheme. Its display, though, was outclassed by both other Hornets in the flying display; the Swiss Air Force F/A-18C provided a tight display with plentiful afterburner, punctuated by a series of graceful “pirouettes”, while the Finnish Air Force F/A-18C performed an extremely aggressive routine, for which it deservedly won the Sir Douglas Bader Trophy for the best individual flying demonstration. 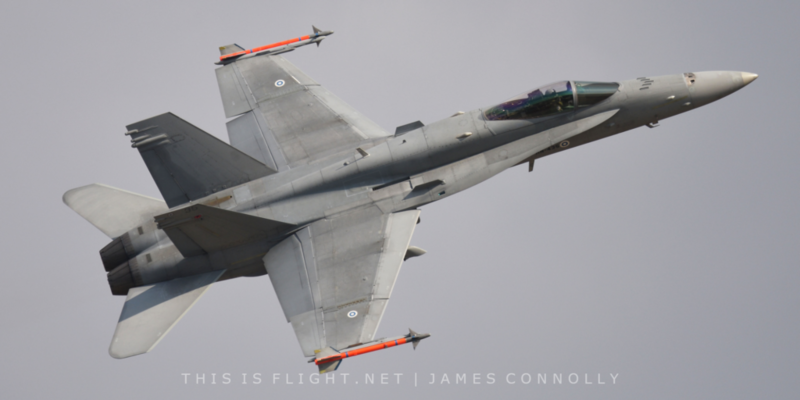 The Lockheed Martin F-16 was another type to see heavy representation in the flying programme, with four different air arms displaying the type over the weekend. The Polish Air Force F-16C “Tiger” team and Hellenic Air Force “Zeus” F-16C Block 52+ displays both represented a marked improvement over previous years, although it was the Belgian Air Force F-16AM “Dark Falcon” and SoloTürk F-16C from the Turkish Air Force which stole the show, with the latter winning the Paul Bowen Trophy for the best solo jet demonstration, among stiff competition. The CzAF JAS-39C Gripen and SwAF JAS-39C Gripen solo displays – both recent Air Tattoo award-winners – returned to the Air Tattoo this year, although neither picked up a trophy on this occasion. In the case of the Czech example, this was entirely understandable, as the display struggled to maintain the attention of the authors; the use of smokewinders by the Swedish jet made for an infinitely more engaging and photogenic routine, and added a dynamic which the Czech Gripen was sorely missing. There were also two examples, too, of the Eurofighter Typhoon. The Royal Air Force Typhoon FGR.4 solo display from 29(R) Sqn proved to be surprisingly enjoyable – the opening three minutes in particular assaulted the crowds with near-constant afterburner during a captivating first half, which perhaps tailed off a little as the display progressed. 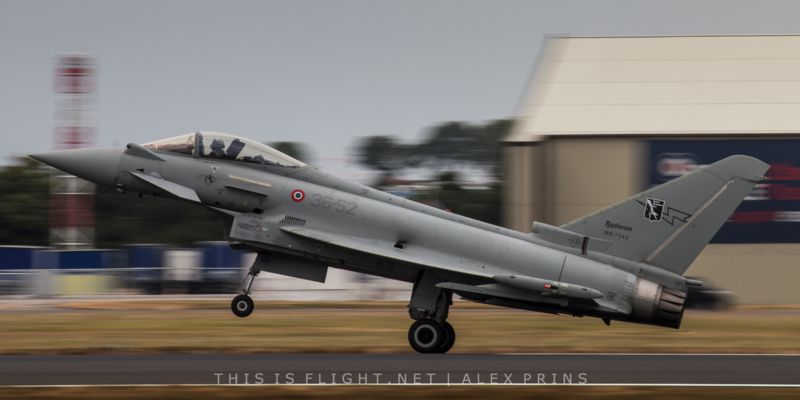 Italy’s Reparto Sperimentale Volo F-2000 Typhoon, meanwhile, was underwhelming in comparison, as one of the higher and more distant displays of the day; this marked a disappointing development following previously superb RSV showings. 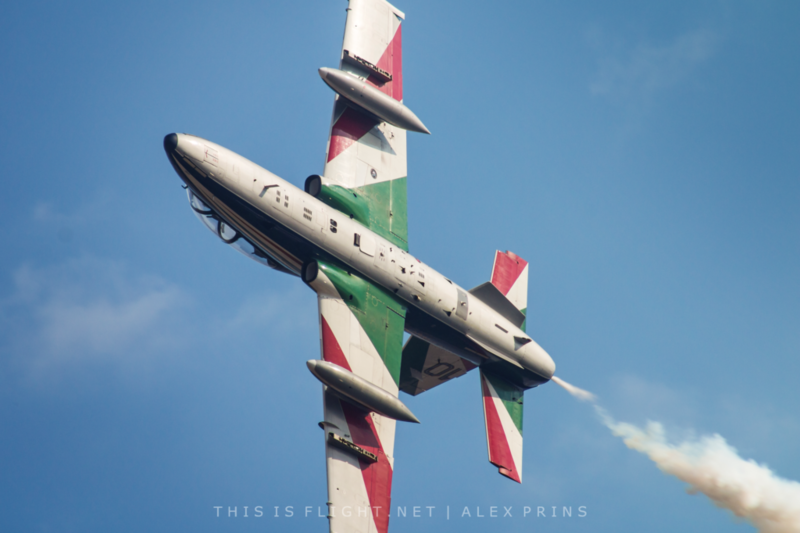 Unfortunately, there is little positive to say about any of the other solo displays provided by the ever-generous Italians. The diminutive RSV T-346A Master once again failed to inspire, while a bizarre decision by the crew of the RSV C-27J Spartan saw the deliberate removal of any aerobatics such as their trademark loops and rolls, in favour of a much less spectacular role demonstration of the aircraft’s “everyday operational capabilities”. It was made clear during the commentary that this was a reversible decision, however it was nonetheless clearly unpopular with those watching. Whereas previously the display had shocked and amazed, this year it simply bored and disappointed. 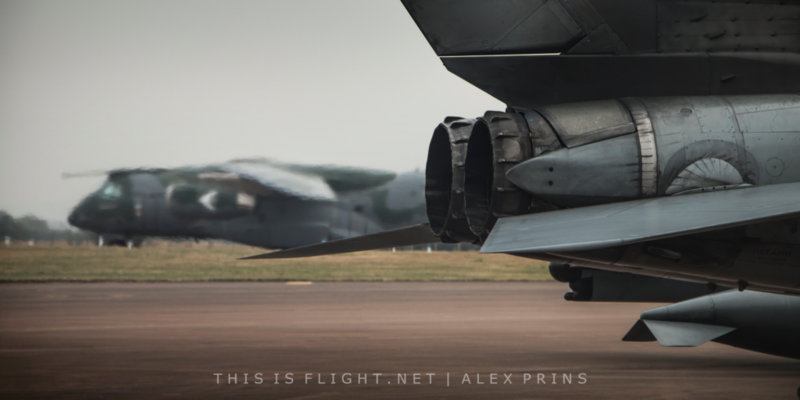 Certainly, the Airbus A400M display proved by far the most entertaining “heavy” at this year’s show. 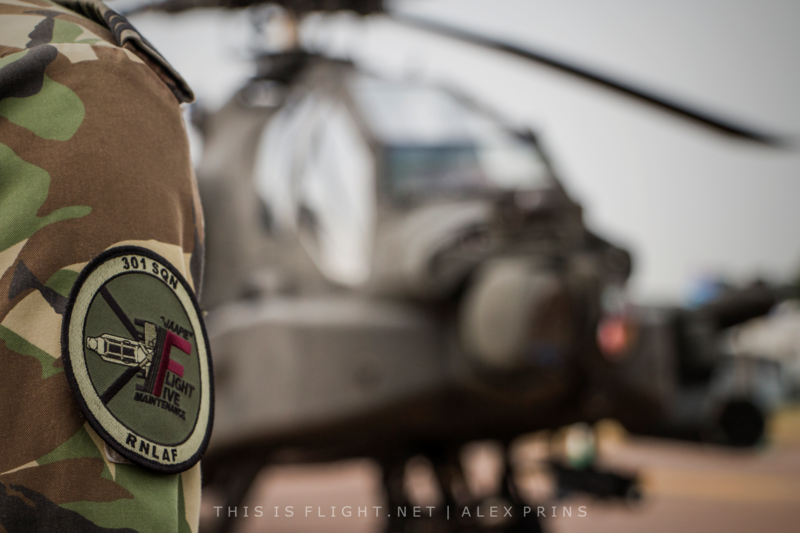 France are great friends of the Air Tattoo, and this year proved no exception. Prior to cancellations aircraft were to be provided by all three branches of the French Armed Forces, however this was soon reduced following the cancellation of the Aerospatiale Puma pair of the Armée de Terre slated for static, along with the aforementioned Aéronavale Breguet Atlantique. 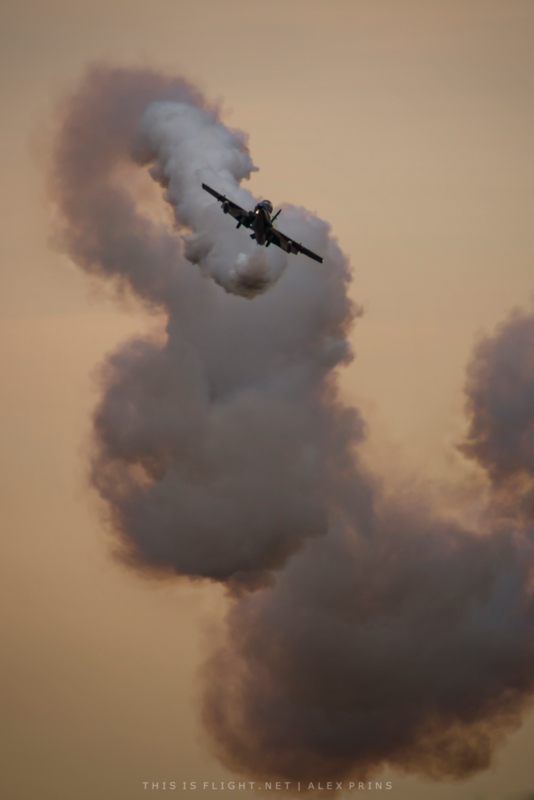 The latter was particularly galling for those who had witnessed the superb rehearsal during the Tuesday arrivals day, which showed great promise, or had been looking forward to its display following last-minute cancellations this year and last at the Yeovilton Air Day. 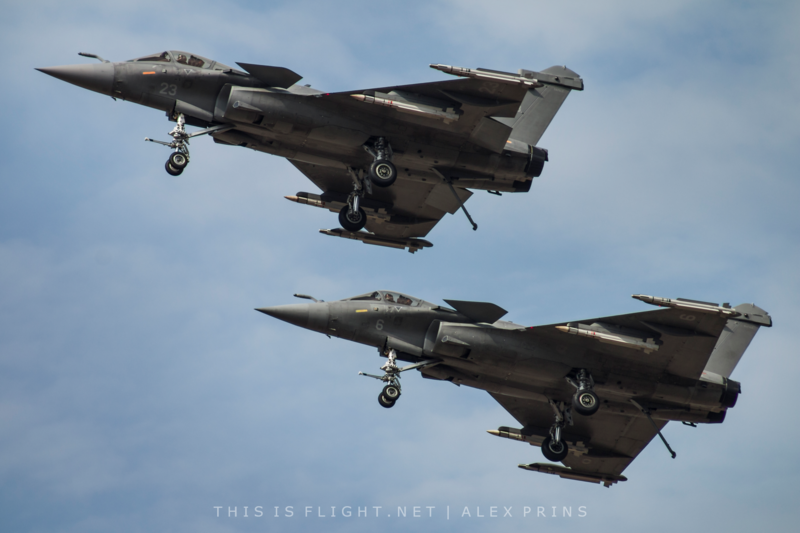 Fortunately, the Aéronavale provided a further flying demonstration, as a pair of Dassault Rafale Ms from Flotille 12F stayed on to make their RIAT debut. 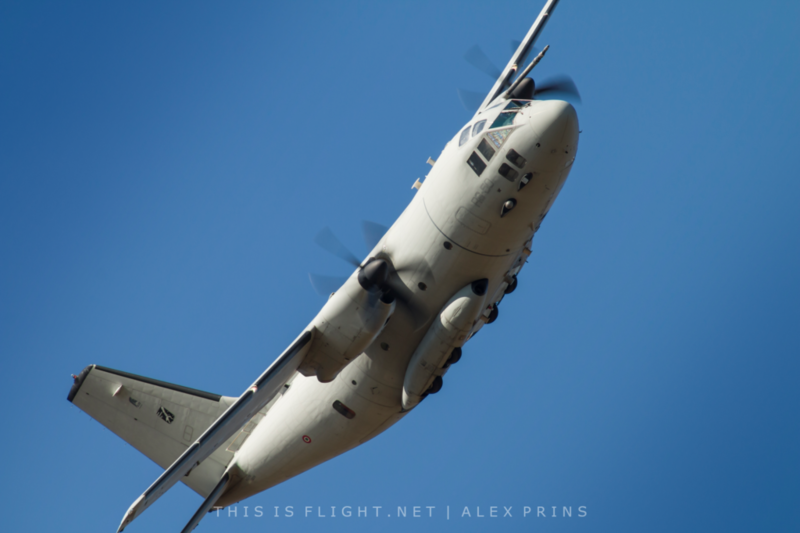 In past years the Aéronavale have displayed at other major airshows to much acclaim, though this display sadly failed to live up to the hype, due to long pauses and some distant manoeuvres. It did, however, improve in quality as the weekend went on – no doubt a consequence of the display having been worked up by operational pilots between operations, rather than as a dedicated display team such as Couteau Delta. 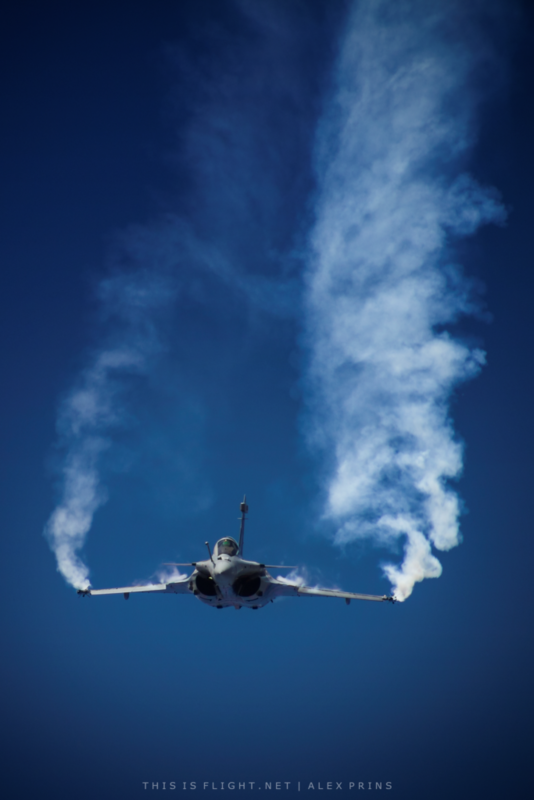 Further aircraft of the Rafale stable were provided by the Armée de l’Air, whose Dassault Rafale C solo display made a welcome return in the hands of Capt. Sébastien Nativel. A typically polished, punchy and flowing routine, it was almost impossible to discern where one manoeuvre ended and the next began. 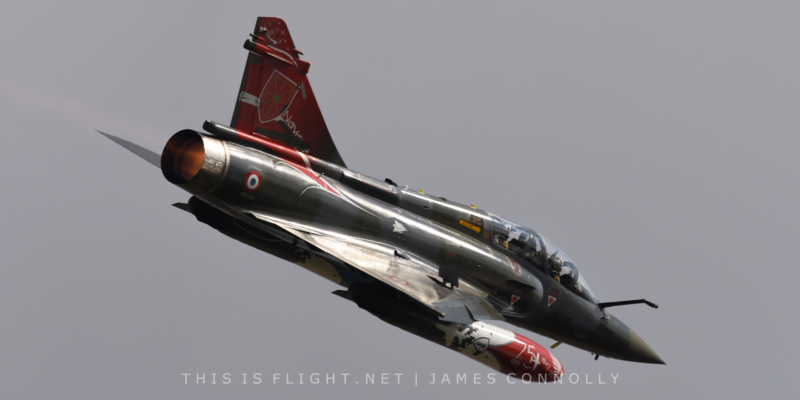 With a display that simply outclassed their naval cousins, the Armée de l’Air’s Couteau Delta pairs tactical demonstration once again provided an astonishing demonstration of airpower, as both Mirage 2000Ds performed plentiful close formation manoeuvres – with afterburners engaged – and astonishing formation rejoins. It came as no surprise, therefore, that they went on to win the As the Crow Flies trophy as voted by members of FRIAT. One of the strangest displays of the weekend came from the USAF F-35A Heritage Flight team from Luke AFB, Arizona. 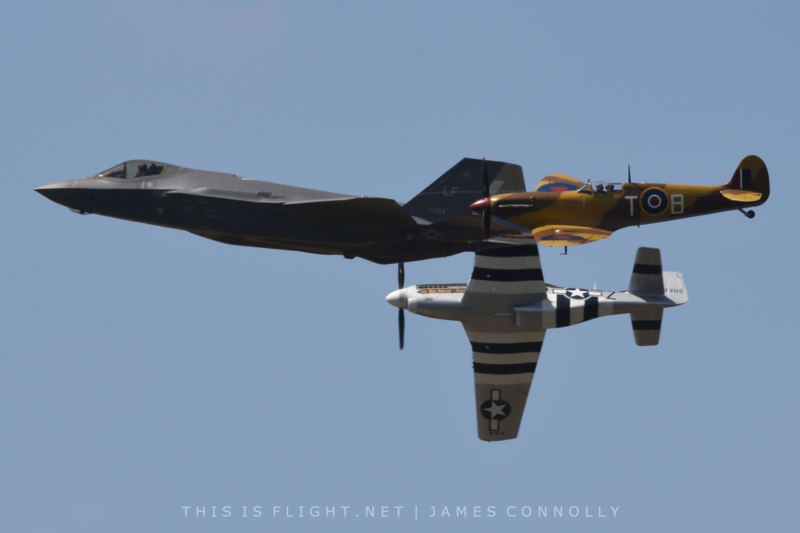 This year’s Heritage Flight celebrated RAF100 by including a Spitfire in the flypasts for the first time, in formation with an F-35A Lightning II and recently imported P-51D Mustang “The Hun Hunter \ Texas”. On the Friday, despite a general expectation of a full heritage flight, we instead witnessed a disjointed and distant F-35A demonstration, during which the majority of manoeuvres were interspersed with gaps of a minute or more while the aircraft disappeared behind the crowd to reposition. The team’s commentator, meanwhile, persisted with a script for an entirely different display profile, despite it being clearly inconsistent and incorrect. On the days that followed, the full formation made it to the show – sort of. Their opening pass was so high that it wasn’t immediately clear whether the display had even started, and the second and third passes were so distant that, had it not been for the obligatory brash and gaudy commentary typical of US demonstration teams, they could quite conceivably have been missed altogether. Of the lighter aircraft, the RAF Tutor and Slovenian Air Force PC-9M Swift both performed solo displays, although the former was clearly not suited to the Air Tattoo’s long crowdline. This was perhaps acknowledged by the organisers, who scheduled it to be the only RAF display with a “day off”, along with the various visiting fast jet displays. 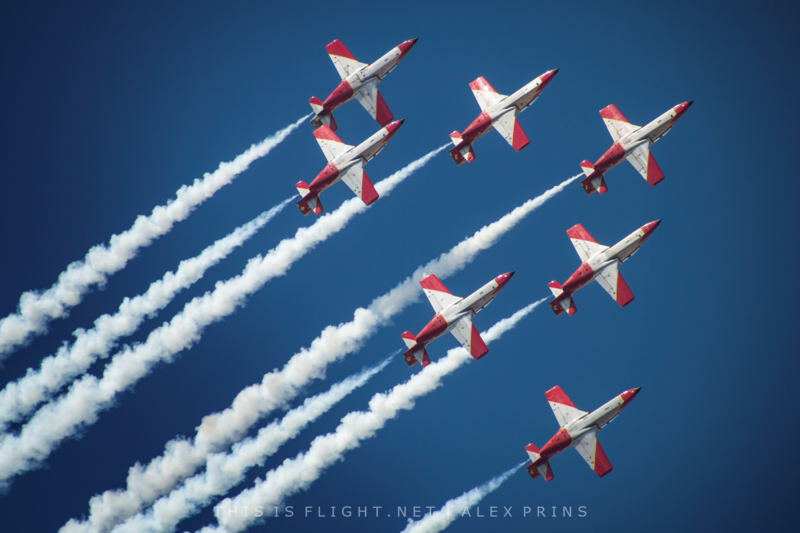 The PC-9, meanwhile, handled the venue well once again, with an immaculately-flown and technically challenging routine which was, consistently, a joy to watch. There were also four rotary solo displays, with enjoyable routines coming from the Finnish Army NH90 TTH, RAF Chinook Mk.6, USAF CV-22B Osprey and Belgian Air Force A109BA. The Chinook and NH90 particularly impressed, with agile manoeuvring and several close passes and hovers which took full advantage of the permitted 150-metre crowdline separation. However, perhaps the biggest disappointment of Saturday’s display was the unexpected cancellation of the Osprey – despite the aircraft having entered the hold to display. 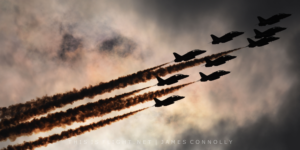 This was due to the Red Arrows’ unbending insistence that they be permitted to depart for a display at the Goodwood Festival of Speed exactly on time, irrespective of whether their being stationary on the runway forced a halt to proceedings. 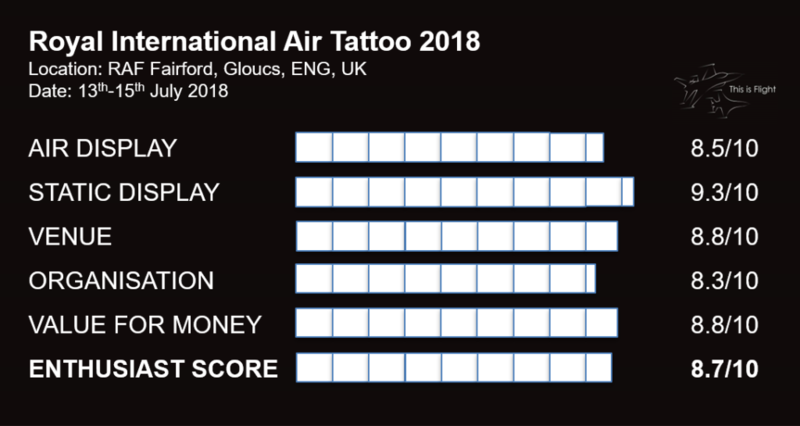 This unnecessarily rigid process no doubt felt a slap in the face to the USAF crew that had prepared their one-display – a rarity outside a select few US shows – and the word “disappointing” was clearly heard on comms as the tiltrotor departed Fairford airspace. 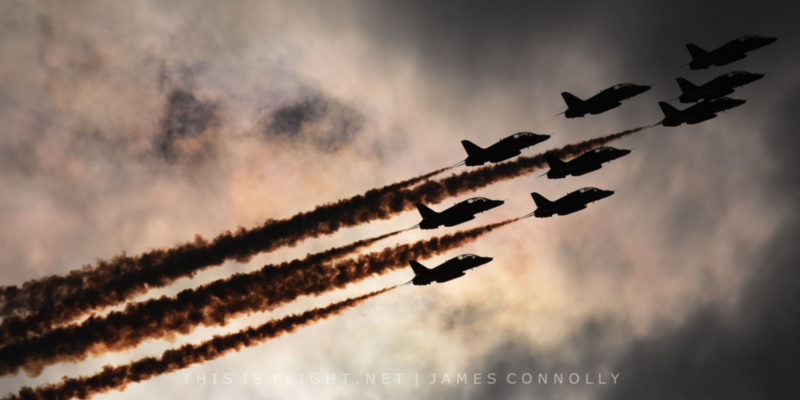 Despite this gratuitous rigmarole, the RAFAT Red Arrows’ displays throughout the week were typically polished, with perhaps their most varied routine of the last few seasons. Particularly of note were the excellent Centenary Split – previously called the Palm Tree Split – and the one-off Centenary Pass, which sees three aircraft paint a number 100 in the sky, while the remainder perform a topside pass with coloured smoke beneath. Their display did not seem to flow as seemlessly as that of the Frecce Tricolori or Swiss PC-7 Team, with long gaps between some manoeuvres, but the team nonetheless took home the Steedman Display Sword for best flying demonstration by a UK participant. RIAT 2018 could perhaps have benefitted from a further national aerobatic team in this most significant of years, with no team attending the event that hadn’t appeared in the past three iterations of the show, however their performances nonetheless proved tremendously enjoyable. 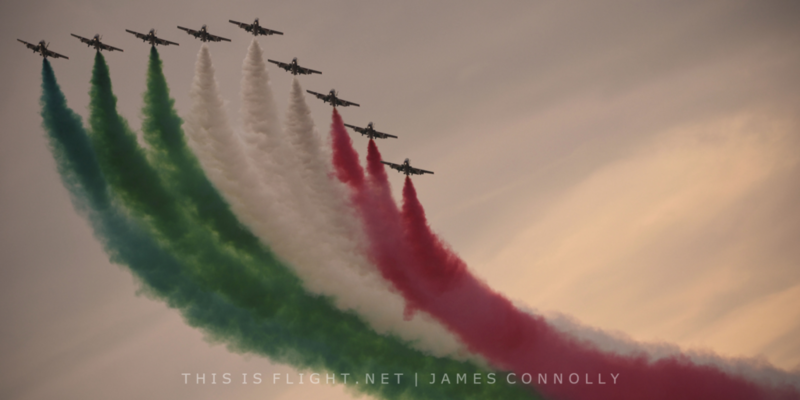 In particular, the Frecce Tricolori’s performance was nothing short of outstanding, featuring some superb crosses and splits, followed by jaw-droppingly slick re-joins and interspersed by immaculate manoeuvres by the solo pilot. The only criticism of their display would be that one of its highlights (a 9-ship bomb burst and cross) was performed only on the arrival days and not during the airshow proper, though this barely detracted from the enjoyment of their routine. Further display teams in attendance were the immaculate and thoroughly enjoyable Swiss PC-7 Team, the Royal Jordanian Falcons (performing at RIAT for the first time with their new fleet of Extra 330LXs) who received the RAFCTE Trophy for the best flying demonstration by an overseas participant, and Patrulla Aguila from Spain. The latter were accompanied by an extremely enthusiastic commentator, but unfortunately such energy was largely missing from the lengthy routine; those still watching by the end of the display (culminating in a formation landing) were left less than ‘Thunderstruck’. It is when we arrive at the one-off RAF centenary celebrations that things begin to come unstuck. Sadly, due to the one period of bad weather all week, the planned 50-aircraft flypast on Friday was cancelled. 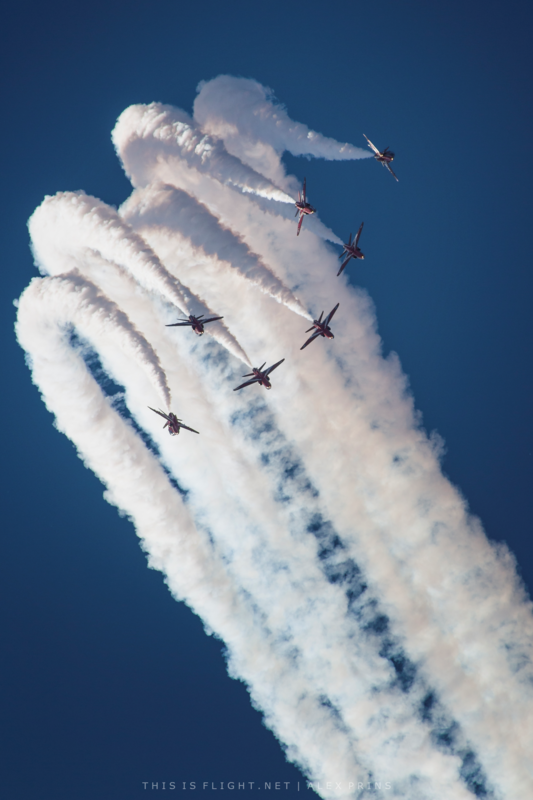 As one of the show’s biggest draws – at least for the Friday – it was disappointing that the RAF’s planning and NOTAM scheduling failed to account for the possibility of bad weather (a foolish decision given the usual summertime climate!) and having put all of their eggs in one basket, the Powers That Be ultimately ended up with egg on their face. On the following two days, the commemorative flypast consisted solely of a diamond nine of Typhoon FGR.4s, which truly was the bare minimum for marking such a momentous occasion. 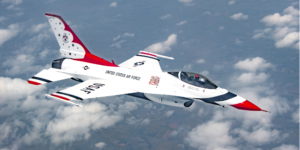 Indeed, with their surprise flypast of a USAF B-2A Spirit from Whiteman AFB accompanied by two UK-based F-15C Eagles on Saturday afternoon, the Americans seemed to put almost as much effort into special one-off flypasts than the RAF did. Civilian displays dedicated to the RAF’s history at RIAT 2018 included the Great War Display Team and a pair of Vampires from the Norwegian Air Force Historical Squadron. Given the history involved, such representation was absolutely right to have been there, however both displays felt perhaps twice as long as they should have been. This smattering of displays lacked a coherence within the wider flying programme, and one can’t help feeling that one-off displays rather than off-the-shelf acts would have been far more fitting. 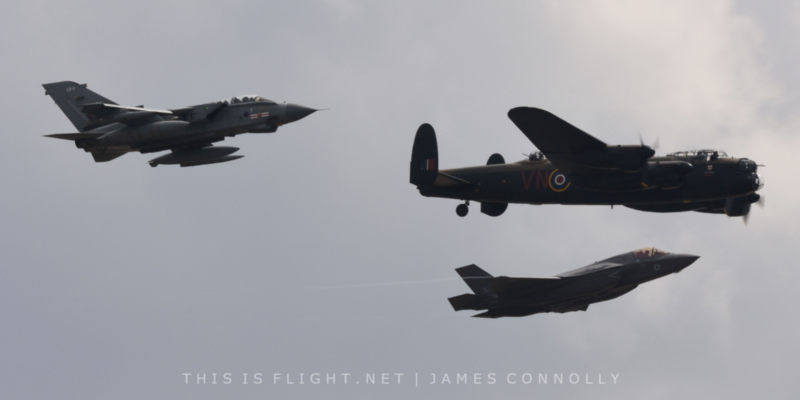 Fortunately, one such act came from the Royal Air Force, with a flypast of Avro Lancaster, Tornado GR.4 and F-35B Lightning II representing the illustrious past, present and future of 617 Squadron. This formation was truly a delight to see, as were the solo passes by both jets that followed, and an illustration of exactly what is possible when innovation and attention is focussed in the right direction. The Lancaster, of course, also participated in the Battle of Britain Memorial Flight’s own displays. On Friday, this consisted of the ‘Memorial’ display (Lancaster and two Spitfires), on Saturday, ‘Trenchard Plus’ (Lancaster, Dakota, three Spitfires and two Hurricanes) and on Sunday, ‘Trenchard’ (Lancaster, Dakota and two Spitfires). ‘Trenchard Plus’ was truly a magnificent sight to behold, as all seven aircraft approached in formation to receive a standing-ovation and scattered applause; as the formation split, there followed a superb synchronised display by a pair of Spitfires, to punctuate the breaks between passes by the less-manoeuvrable Lancaster and Dakota. The Flight very deservedly won the King Hussain Memorial Sword for the best overall flying demonstration, having doubtless provided some of the most memorable moments of the entire week. 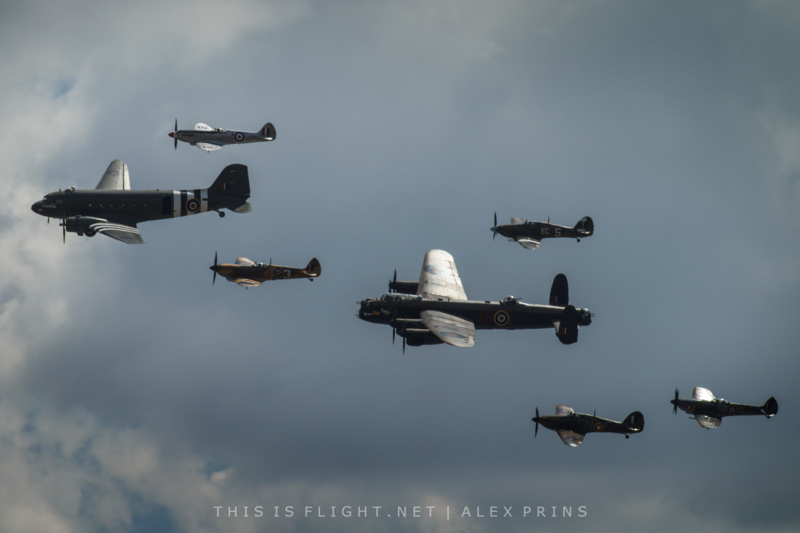 However, while the BBMF display and 617 Squadron flypast have been deservedly heaped with praise, I can’t help but feel that it wasn’t really enough to rescue an anniversary that has felt, at times, like a bit of a damp squib. There was so much potential for more of the same – for example the otherwise-faultless lead commentator, Ben Dunnell, pointedly noted that on Saturday, the Red Arrows and Vampire pair were flying back-to-back but not together… that in itself would have been an appropriate flypast commemorating RAF aerobatic teams past and present. 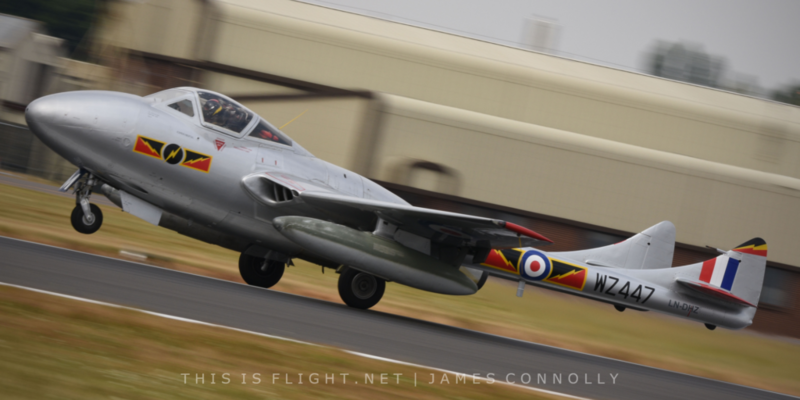 Alternatively, the Gloster Meteor T.7/F.8, Jet Provost T.3, Jet Provost Mk.5, Folland Gnat T.1 and Vampire T.55 were all present in the flying or static displays, and could have combined for a flypast of RAF training aircraft. Indeed, both Vampires were in RAF squadron markings and could conceivably have flown with modern-day representatives of aircraft from those squadrons, which were present in the static display! Even the return of the RAF’s Synchro Pair (Typhoon and Spitfire), usually used in Battle of Britain anniversary years, would have been very welcome. Of course, this being the aviation world – and particularly the RAF – there are any number of reasons why this may not have been possible, but one feels it is exactly the kind of one-off performance that other major air arms would stage, just as the Swiss did with typically impeccable style for their centenary show four years ago. 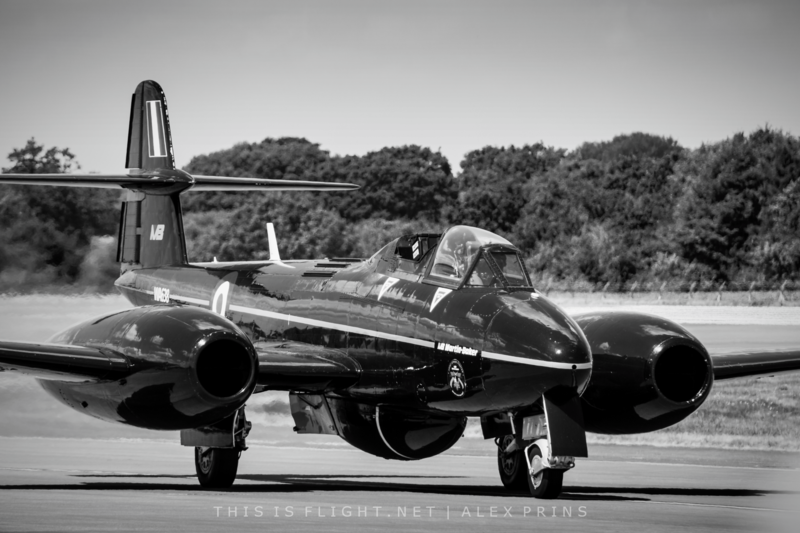 As for all other aspects of the show’s organisation, they were exactly as slick as you would expect for an airshow that has been running for the best part of half a century. Signage to the Park and View West enclosure was a little lacking, but otherwise entry into the showground was reasonably swift throughout the week (though social media was circulating with complaints regarding traffic management upon exit). My one quibble was that, for those of us who were camping, the pedestrian exit at the red gate was not particularly conveniently placed and funnelled spectators on a needlessly-lengthy route over a largely redundant footbridge. Simply allowing spectators to depart from the nearby yellow gate would have significantly shortened the walk and been preferable for all. In past years, RIAT staff have come under criticism for rudely forcing the departure of spectators well before the showground was due to close. Luckily this worrying trend seems to have dissipated in recent years. A special mention must go to the wonderful staff at Park and View West, who were among the friendliest encountered at any airshow; nowhere else will staff members stop to have a chat between arrivals, periodically provide personal updates on the latest movements, and check spectators are wearing sufficient sun cream! This friendliness combined to make West an incredibly relaxed and pleasant location, regardless of the runway direction in use. Another niggle with the Air Tattoo is with elements of its commentary. This is provided in the most part by the excellent Ben Dunnell, ably assisted by Group Captain Mark Manwaring, and is utterly superb. However, between the displays, George Bacon and Sam Waller often took the microphone to read clumsy and stilted pre-written announcements about the Techno Zone and Vintage Village. Not only does it seem wholly pointless to employ two commentators who only speak for a few minutes each day, but the continual insistence that we should visit these minor showground attractions becomes extremely wearing. 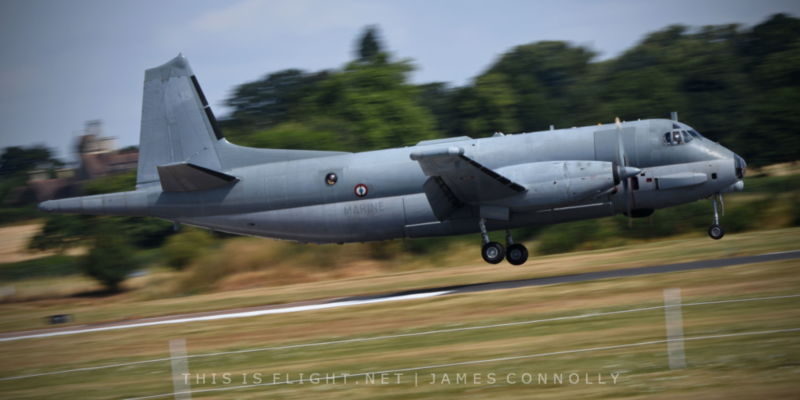 That being said, as a complete package, it is hard to fault RIAT 2018, and there is little doubt in my mind that it was the best airshow anywhere in the world since the Swiss centenary effort in Payerne four years ago. At the end of the day, the sheer quantity, quality and variety of participating aircraft is virtually unmatched. But at the same time, following several years of diplomacy with July 2018 as the long-term focus, it must be said that the “RAF100 effect” failed to materialise with much substance. The much-touted discussions with dozens of far-flung nations seem to have come to nought, and at times a wander through the static park or perusal of the flying programme would give the impression that this year was a “good RIAT”, but not the culmination of years of negotiation geared towards an unrepeatable, unprecedented extravaganza to celebrate the centenary of perhaps the single most significant air force in the world. Indeed, it would have only taken a badly-timed toilet break and you could have been forgiven for failing to notice that there was any centenary taking place at all. This year’s Air Tattoo may be defined by a herculean effort by the organisers at Douglas Bader House, let down by an RAF hamstrung by budget limitations, and what appears outwardly to be very much a “that’ll do” ethos in the upper echelons of the service. The stated objective of RAF100 was to “make our people and the public feel proud of the RAF and inspired about its future.” On the basis of the 2018 edition of the Royal International Air Tattoo, this has emphatically failed. 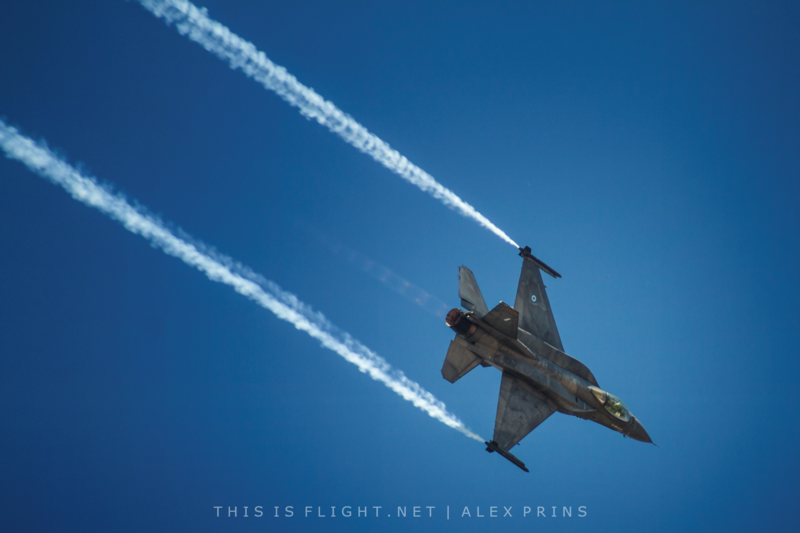 This report was written by Adam Landau, founder and editor of This is Flight, and deputy editor Alex Prins. Photos come from Alex Prins and James Connolly. Video by Adam Landau.